I would like to start with a reminder about U turns in the road outside the school. I understand that time is important for all, but safety is paramount. Over the last few days a number of cars have been making U turns in the road, crossing the pedestrian walkways and potentially causing accidents to pedestrians. Please do not make U turns; either use the turning route into the car park and follow the traffic round or use the roundabout through the security gate in La Reserva. 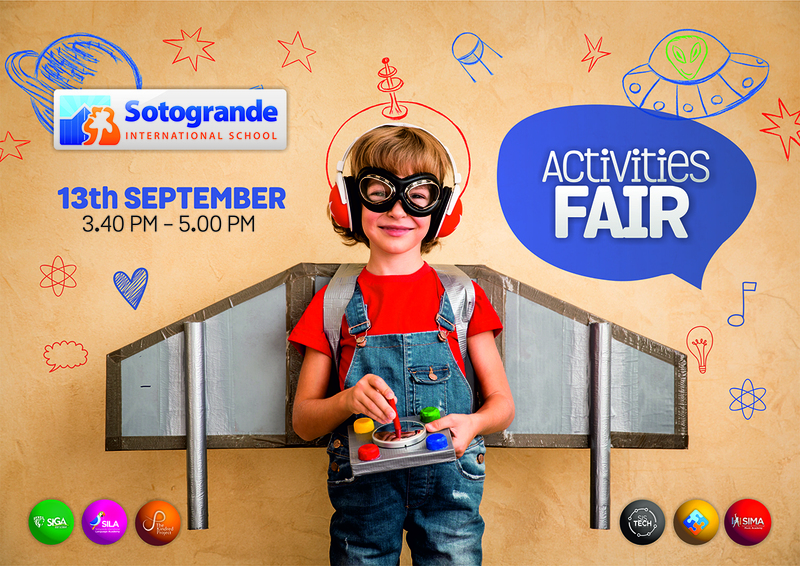 To help with traffic we have 2 buses running on a trial basis within Sotogrande (Costa and Alto) throughout September. The service is available in the mornings only. Not only will the use of these buses help to reduce the traffic jams and congestion near the school, but will at the same time contribute to helping the environment. We hope you will find these of interest. 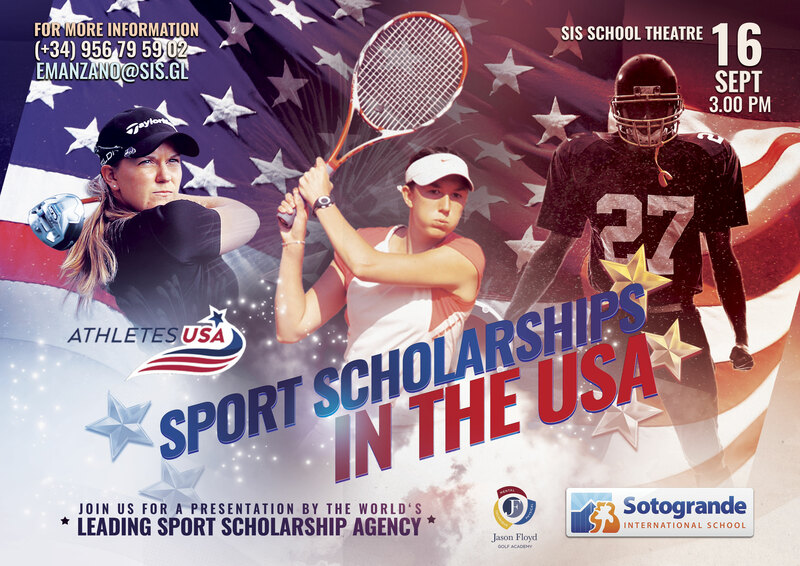 Next Friday 16th September we are pleased to be hosting a presentation here at SIS by Athletes USA, the world’s leading sports scholarship agency. If your child is passionate about playing sport at the highest level, join us at 3pm on 16th September to learn more about gaining sporting scholarships and entry to USA universities. 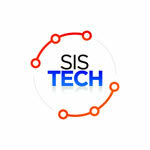 We have had another busy week at SIS. Last Thursday we began the year with an assembly where we introduced the students to all our new staff. It was a lovely way of connecting our whole student and teacher community. On Monday we welcomed our EC1 students for their first day at school. Although there were some tears at the start of the day, students gained in confidence and left with smiles and happiness. Meanwhile, Mr. Sanchez hosted a training session for secondary parents on the use of Managebac. Additionally on Monday we hosted Meet the Advisor sessions for M1 – M3 parents and the D2 parents and students attended a meeting to share expectations for the upcoming year. On Wednesday we hosted our Meet the MYP Coordinator, M4 and M5 Advisor sessions, our D1 parent and student meeting and the first of our primary Meet the Teacher sessions, which continued throughout the week. I would like to publically thank all of the parents who attended these meetings. It is a wonderful way of building relationships, sharing expectations and ensuring that the communication channels are open. Thursday saw the first unit-based trip of the year with P4 students heading off to Jimena for the morning to make connections for their unit on Symbolism and to bond as a year group. In addition on Wednesday and on Thursday afternoons our KP team started their first initiative with a secondhand Uniform Shop in the playground. Thank you for your support for this Dreaming Dragons venture, all the money raised will be used supporting various other Dreaming Dragons social entrepreneurship ideas and initiatives. Labeling of possessionsAlready this term we have accumulated numerous articles of lost property; parents, please ensure all articles of clothing, particularly school uniform, are suitably marked with your child’s name. Global Citizenship at Sotogrande International SchoolThank-you to everyone in the community, parents and students, who shared their thoughts this week on our Global Citizenship ‘Wonder Wall’. This will be very helpful input as we move forward and continue to develop our programme. I hope you all enjoyed a wonderful summer break! Over the summer there have been many improvements and changes to our Primary School, all of which will improve the teaching and learning opportunities and experiences for our students. These changes have included acquiring new teaching classrooms, increasing in the number of Teachers and Teaching Assistants, expanding to three form entry in four year groups, redesigning a number of teaching areas, decorating in all buildings, expanding and improving recreation areas and acquiring new teaching resources and equipment. We really have had a fantastic start to the new school year. It was wonderful welcoming back all the returning students and seeing their smiling faces as they met their friends and new teachers. It was equally as wonderful welcoming all our new students. Walking around the three primary buildings this week, children were enjoying their learning and enjoying their new learning spaces. What a Wonderful Start for our Youngest Students! Monday was the first day of school for our youngest students in EC1. It was a delight to watch the children settle, make friends and play so quickly! Our Early Childhood Team of teachers form a dynamic, effective and highly motivated group of practitioners who implement the school’s philosophy and educational objectives through play based learning. For any parents who did not manage to join in these meetings, please make contact with the class teachers to get the information you may need. This workshop will be especially interesting for parents of children in EC1, EC2 and P1. It will be held at 9.00am in EC2 Miss Lucia’s room. We are looking for adult volunteers to support reading in our Primary School on a regular basis. This would involve supporting a particular year group, class or group of students. We would very much like to encourage support, not only for English and Spanish, but also for other mother tongue languages. If you are interested in becoming a reading support volunteer for this term, please click on this link and complete the form. The use of a graphical display calculator (GDC) is a requirement of the Diploma programme and it is compulsory that every student has his/her own in D1. The graphical calculator that we work with at SIS is a Texas Instruments TI- 84 or TI- 84 Plus or TI-84 Plus C Silver Edition (Please note that no other type will be acceptable). University maybe a long way off for some of our children however, if they are passionate about playing sport at the highest level then come and join us on 16th September for a presentation from Athletes USA to learn more about gaining sporting scholarships and entry to USA universities. Ecuador; an unknown place on the map to all but one of us that embarked on this journey. In collaboration with The Kindred Project and the Yanapuma Foundation, we hope that this adventure is the first of many. Arrival to Quito enabled us to become acclimatised to the altitude and the vibrant city, giving us a quick taste of Ecuadorian culture. However, it was our venture into the jungle, taking us far away from the creature comforts we know, which gave us a real sense of purpose. Our intention was to integrate with the Tsáchila indigenous community, and having done so we left with an abundance of new experiences, values and memories that we will forever hold dear to us. by Lauren Hidalgo, D2 student. The PTA committee would like to welcome you all back, for what promises to be an action-packed year. To all of our new parents, welcome to the SIS Family! New Parents’ Coffee Monday 12th September – come along and find out a bit more about what we do, and meet some new friends. In the Chiringuito, at 9am. Everyone welcome. PTA meeting-Tuesday 20th September 9:15 in the Cantina. Your chance to find out about and discuss school issues. 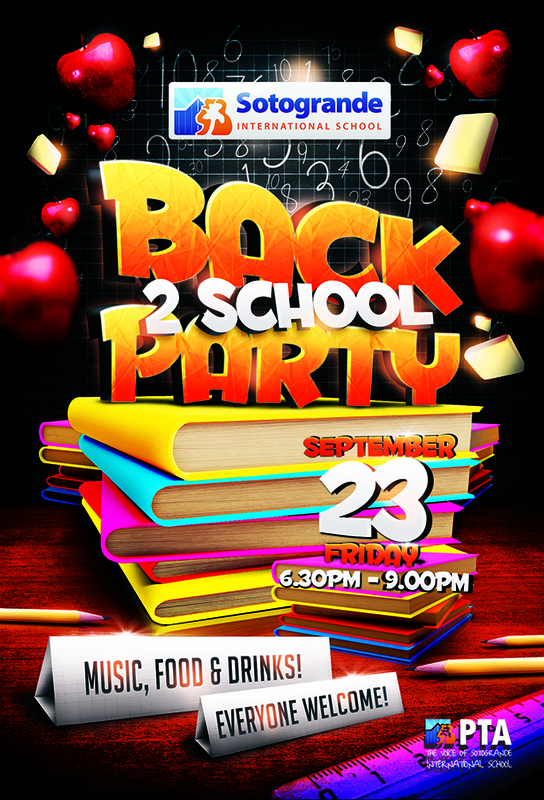 Back to School Party-Friday 23rd September. Mark your calendars for a night of great food, drink and entertainment. We need lots of volunteers! Please email ngsispta@gmail.com if you would like to help.